The Director of the Department of Materials Engineering and Ceramics (DEMAC) of the University of Aveiro (UA) and CICECO Researcher, Mário Ferreira, won the H. H. Uhlig Award from Corrosion Division of the The Electrochemical Society (ECS). The prestigious award was announced during the 224th Meeting of the ECS, that gathered in San Francisco (U.S.) the world's best researchers in the field of electrochemistry. During the meeting Mário Ferreira gave an Award Lecture on "Activate Corrosion Protection By LDHs." 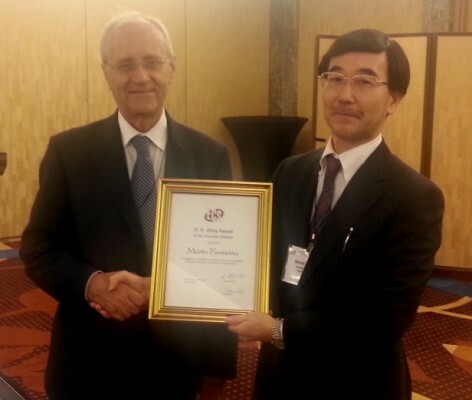 "This award is an international recognition of the work I have been developing in the areas of corrosion and protection of metals, particularly in recent years with the development of smart coatings for corrosion protection and may have applications in other fields such as sensors", welcomes Mário Ferreira . Researcher at UA since 2001, Mário Ferreira, PhD in Corrosion Science and Engineering, points out that the prize , created in 1972 to recognize excellence in research and relevant technical contributions to the field of corrosion science, "is a recognition of the work by DEMAC / CICECO". The researcher devotes the same distinction to all the collaborators, from past and present, that worked with him. " It was because of them that I managed to get this award", recognizes .